As our crime series Chemins nocturnes (Night roads) is celebrating its twentieth anniversary this month, we are glad to be able to introduce to you the characteristics of this series, entirely dedicated to French crime fiction. In brief : a unique atmosphere, original characters, fine writing and also a certain freedom within the codes of the crime genre. Below is the good news on some recent titles of this series that we would like to share with you. Should you wish to receive a finished copy of the French editions, or in another language available, please do not hesitate to contact me. “There is a strong flavor of Simenon in the way she evokes Paris”. “It is unusual to find a crime novel that works on so many levels simultaneously in terms of characterisation, location, plotting and dialogue”. German, Swedish and Spanish ! 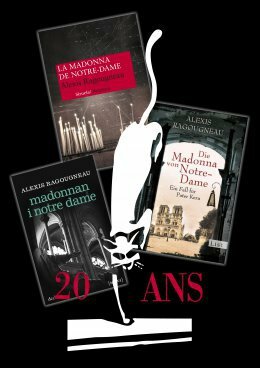 Three foreign editions of La Madone de Notre Dame by Alexis Ragougneau will be out in Germany (Ullstein), Sweden (Sekwa) and Spain (Siruela). Discover the foreign covers above ! The German edition of Arab Jazz by Karim Miské has just entered the KrimiZeit bestsellers’ list at number ten. Foreign rights have been sold to Germany (Lübbe), Italy (Fazi), the United Kingdom (MacLehose Press) and Argentina (Adriana Hidalgo) but are still available in many countries including Scandinavia and the Netherlands.